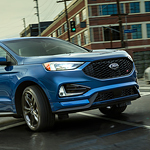 Get the Performance You Need with the Ford Edge ST | Randy Wise Ford Inc. Sometimes you just want a little more power in your vehicle. That's where the Ford Edge ST comes in. As the first performance SUV from Ford, the Edge ST is a clear winner in the mid-size SUV category among our customers. The Edge ST's 2.7-liter turbocharged engine gives you an amazing amount of power for any job that you have. Imagine driving on the road with an engine that gives you 335 hp and 380 lb.-ft. of torque. You'll also get a large array of driver-assist features to help avoid crashes and keep you safe in almost any situation. The Edge ST also comes with four selectable driving modes, which allow you to customize your driver wherever you go. Choose the new Sport Mode for more stopping power and improved handling and traction. Intelligent all-wheel drive allows you to disconnect the front wheels to reduce drivetrain drag.